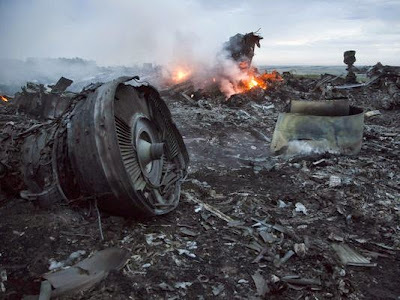 HRABOVE, Ukraine -- Ukraine accused pro-Russian separatists of shooting down a Malaysian jetliner with 298 people aboard, sharply escalating the crisis and threatening to draw both East and West deeper into the conflict. The rebels denied downing the aircraft. The debris at the crash site of MH17 near the village of Hrabove, Ukraine, Thursday. American intelligence authorities believe a surface-to-air missile brought the plane down Thursday but were still working on who fired the missile and whether it came from the Russian or Ukrainian side of the border, a U.S. official said. Bodies, debris and burning wreckage of the Boeing 777 were strewn over a field near the rebel-held village of Hrabove in the Donetsk region of eastern Ukraine, about 40 kilometers (25 miles) from the Russian border, where fighting has raged for months. U.S. Vice President Joe Biden described the plane as having been "blown out of the sky." The aircraft appeared to have broken up before impact, and there were large pieces of the plane that bore the red, white and blue markings of Malaysia Airlines — now familiar worldwide because of the carrier's still-missing jetliner from earlier this year. The cockpit and one of the turbines lay at a distance of one kilometer (more than a half-mile) from one another. Residents said the tail was about 10 kilometers (6 miles) farther away. Rescue workers planted sticks with white flags in spots where they found human remains. There was no sign of any survivors from Flight 17, which took off shortly after noon Thursday from Amsterdam to Kuala Lumpur with 283 passengers, including three infants, and a crew of 15. Ukrainian President Petro Poroshenko called it an "act of terrorism" and demanded an international investigation. He insisted his forces did not shoot down the plane. A distraught Akmar Mohamad Noor, 67, said her older sister was coming to visit the family for the first time in five years. "She called me just before she boarded the plane and said, 'See you soon,'" Akmar said. Counsellors were meeting with a few family members in the airport viewing gallery, sealed off from a horde of journalists. One woman emerged in tears and was escorted out of the airport by a security officer without saying anything. It was the second time a Malaysia Airlines plane was lost in less than six months. Flight 370 disappeared in March en route from Kuala Lumpur to Beijing. It has not been found, and the search has focused on the Indian Ocean far west of Australia. "This is just too much," said Cindy Tan, who was waiting at the airport for a friend on another flight. "I don't know really why this happened to a MAS (Malaysia Airlines) plane again." Ukraine's security services produced what they said were two intercepted telephone conversations that showed rebels were responsible. In the first call, the security services said, rebel commander Igor Bezler tells a Russian military intelligence officer that rebel forces shot down a plane. In the second, two rebel fighters — one of them at the crash scene — say the rocket attack was carried out by a unit of insurgents about 25 kilometers (15 miles) north of the site. President Barack Obama called the crash a "terrible tragedy" and spoke by phone with Russian President Vladimir Putin as well as Ukraine President Poroshenko. Britain asked for an emergency meeting of the U.N. Security Council on Ukraine. "This tragedy would not have happened if there were peace on this land, if the military actions had not been renewed in southeast Ukraine," Putin said, according to a Kremlin statement issued early Friday. "And, certainly, the state over whose territory this occurred bears responsibility for this awful tragedy." At the United Nations, Ukrainian Ambassador Yuriy Serheyev told the AP that Russia gave the separatists a sophisticated missile system and thus Moscow bears responsibility, along with the rebels. More than half of those aboard the plane were Dutch citizens, along with passengers from Australia, Malaysia, the United Kingdom, Germany, Belgium, the Philippines and Canada. The home countries of 41 people were not confirmed. Australian Prime Minister Tony Abbott told Parliament Friday that authorities owe it to the families of the dead to find out exactly what happened and who was responsible. "As things stand, this looks less like an accident than a crime. And if so, the perpetrators must be brought to justice," he said. The different nationalities of the dead would bring Ukraine's conflict to parts of the globe that were never touched by it before. Ukraine's crisis began after pro-Moscow President Viktor Yanukovych was driven from office in February by a protest movement among citizens angry about endemic corruption and seeking closer ties with the European Union. Russia later annexed the Crimean Peninsula in southern Ukraine, and pro-Russians in the country's eastern regions began occupying government buildings and pressing for independence. Moscow denies Western charges it is supporting the separatists or sowing unrest. Kenneth Quinn of the Flight Safety Foundation said an international coalition of countries should lead the investigation. Safety experts say they're concerned that because the plane crashed in area of Ukraine that is in dispute, political considerations could affect the investigation. The RIA-Novosti agency quoted rebel leader Alexander Borodai as saying talks were underway with Ukrainian authorities on calling a short truce for humanitarian reasons. He said international organizations would be allowed into the conflict-plagued region. Some journalists trying to reach the crash site were detained briefly by rebel militiamen, who were nervous and aggressive. Malaysia Airlines said Ukrainian aviation authorities told the company they had lost contact with Flight 17 at 1415 GMT (10:15 a.m. EDT) about 30 kilometers (20 miles) from Tamak waypoint, which is 50 kilometers (30 miles) from the Russia-Ukraine border. Anton Herashenko, an adviser to Ukraine's interior minister, said on his Facebook page the plane was flying at about 10,000 meters (33,000 feet) when it was hit by a missile from a Buk launcher, which can fire up to an altitude of 22,000 meters (72,000 feet). He said only that his information was based on "intelligence." Pro-Russia rebels claimed responsibility for strikes on two Ukrainian Sukhoi-25 jets Wednesday. Ukraine's Defense Ministry said the second jet was hit by a portable surface-to-air missile but the pilot landed safely. Three hundred civilian, innocent people just being slaughtered, news agencies reported that there are evidences pointing to the same direction. What World Leaders are planing to do beside expressing their condolences? Look! Germany is reacting eminently, it wags its finger and saying: bad boy. Lets negotiate with the killer instead of punishment.